Some of my historical time periods are idle. So when thoughts returned and conversations developed recently about The Grand Alliance, percolations bubbled up to the surface. My collection is not large but here are my French circa 1680-1700 with some very preliminary thoughts. Click on images to enlarge them. Régiment Picardie's 1st and 2nd Battalions. Each has three divisions, one pike and two with muskets. Uniforms were exactly copied from a striking color painting in the book Drapeaux et Étendards Du Roi. It is entitled Détachement du régiment de Picardie vers 1680. (Aquarelle Rousselot, copyright Musée de l'Armée) Rousselot's paintings spanned several French time periods. They are exquisite. This is an era where many flags are carried. The Rousselot painting shows three. Hence, three GMB 18th century flags were posted in each battalion. 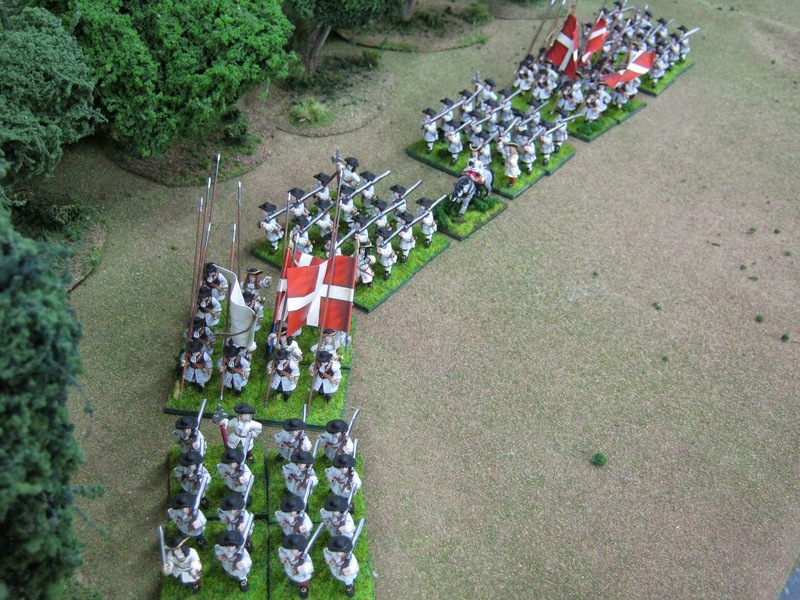 The white national flag of Louis XIV is properly carried on the right while Battalion flags are to it's left. Only the first battalion would have the white flag. The second battalion shown previously carries three red flags. The same can be said for third and fourth battalions. Miniatures are 28mm Foundry castings. As 1700 neared the percentage of pikes reduced several times - eventually being abandoned. Here they are 1/3 of each 48 casting battalion. This way each division would at least start equally and perhaps the whole produces an attractive ensemble. One casting equals ten real soldiers. Maison du Roi Gendarmes. Thirty-six 28mm Foundry castings. GMB supplied the flags for these two bodies. Maison du Roi Grenadiers a Cheval. Some will know the coat color eventually changed to dark blue. However, this early it was still red. Twelve 28mm Front Rank castings. The flag is from GMB. The above references are only a diminutive sample of Pike & Shot resources available to us. 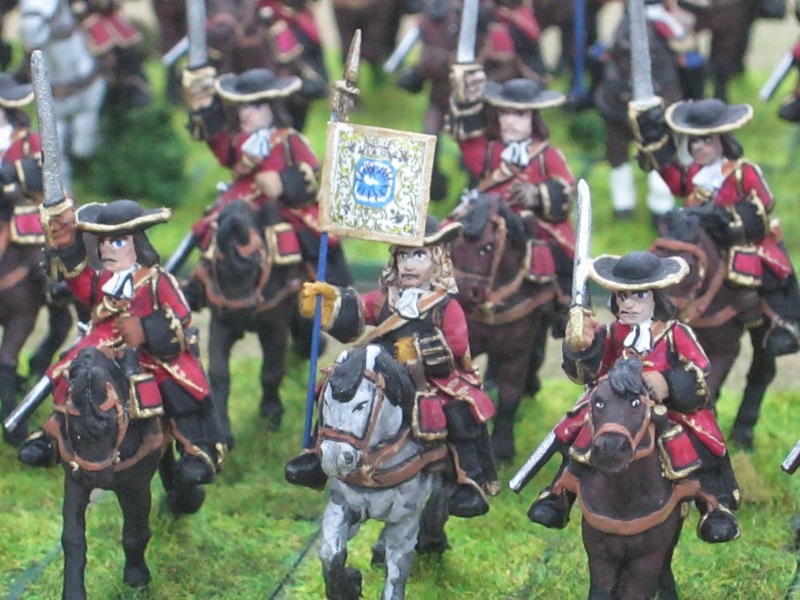 Brigadier Peter Young wrote voluminously about the English Civil War; (middle of the 17th Century). My own rules book dated from 1977 was produced as a result of his excellent research and writing style. Not shown is Robert S. Quimby's The Background of Napoleonic Warfare. It offers a gold mine of information about theory, formations and tactics for the late 17th and all of the 18th century. 1) My French are itching to get out of their storage box and onto the tabletop again. 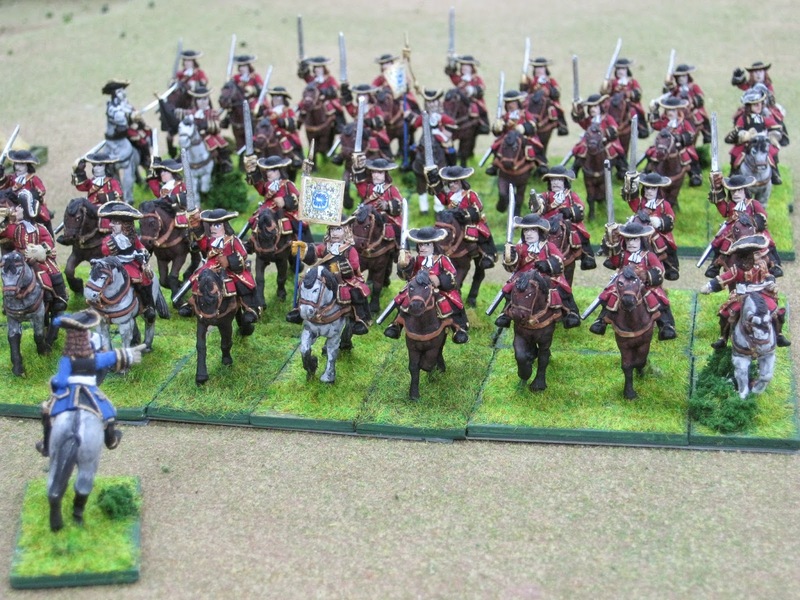 The contingent is not large though there may be another regiment of cavalry and a third battalion to paint in storage. Kurt and Rob can add significantly more to make games possible. 2) Organization. It could change given unknowns. However, I based my hommes so I could switch castings in and out to form different structures. Another idea I had when starting this was to paint a multi-battalion regiment of infantry. That's why Picardie has two. If I remember correctly, it could have up to four in the mid-18th Century anyway. 3) Bill. You only have guard cavalry! I know. Well, they wore gorgeous uniforms and they can always pretend to be non-guard. Anyone for the Chevalier de Protz Cavalerie Régiment - non-guard? 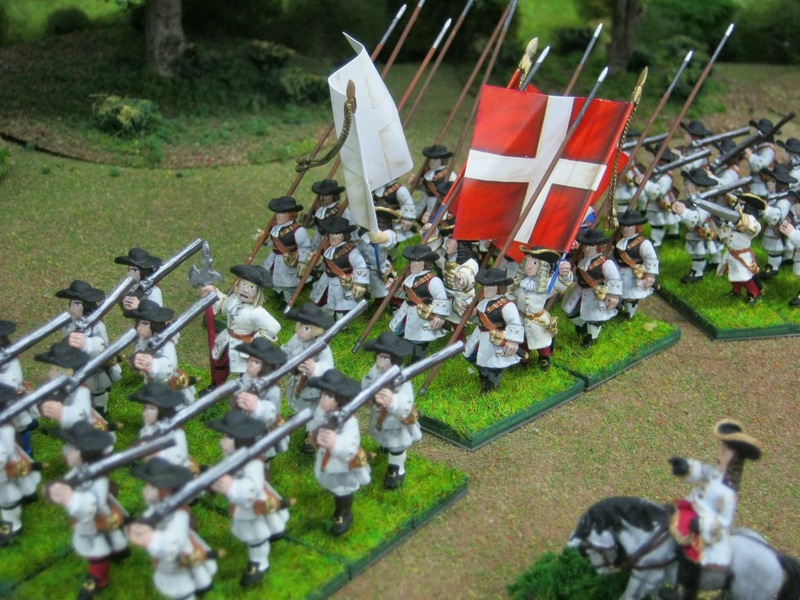 4) Rules: Batailles de l'Ancien Régime 1740-1763 has been adapted to the Pike & Shot era. Movement rates were slowed somewhat from the 1750s. It had to be based on Quimby's remarks. The first fire bonus has been cut down a little. Anyone with matchlocks will fire just a wee bit less effectively than flintlocks. 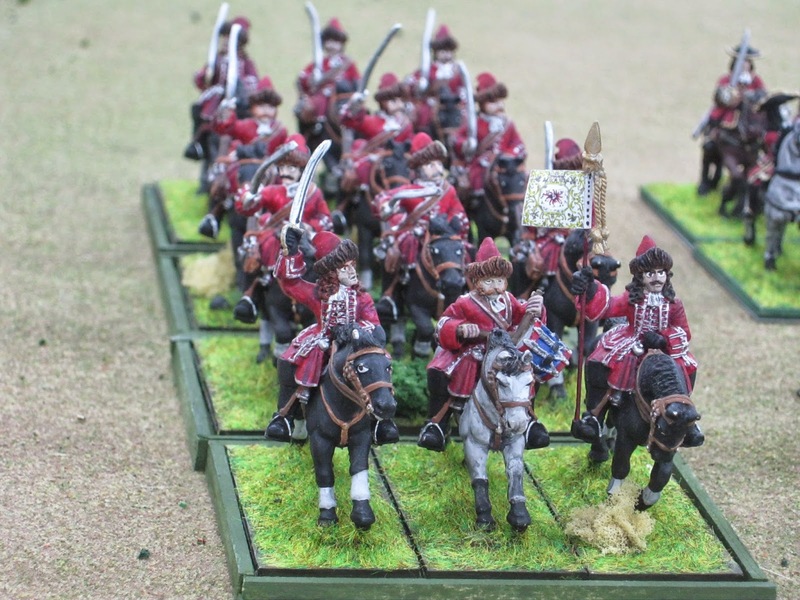 Cavalry versus pike blocks will be tough on the horsemen. Artillery has been slowed considerably. Mobile would not be a word to describe the 4, 8, 12 and 16 pounders found in the French Army. Even the occasional so-called light French 4 or 8 pounder that did exist at the time will not be fleet of foot. There are also 1-3 and 6 pounders available for other nations. Anyhow, I'm suggesting we try BAR Pike & Shot for now. 5) Games: We are in the earliest stage of figuring out when some dice can be thrown in a first game using Grand Alliance units. November possibly. 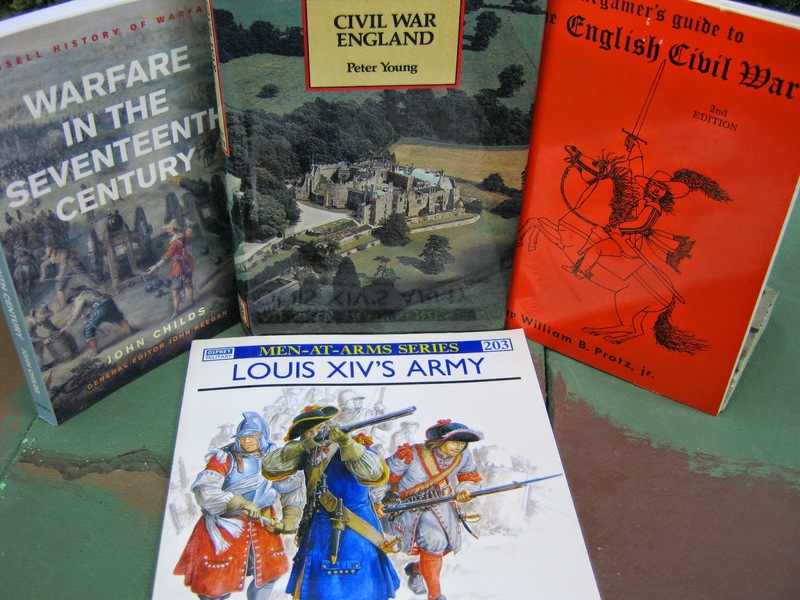 However, this morning it occurred to me I can test the rules during our occasional weeknight games using my collection of English Civil War Pike & Shot units. The latter want to get out of their storage boxes too! Weeknight games last about two hours. If unfinished, we return the next week to conclude them. 6) Am I abandoning other time periods? Not at all. 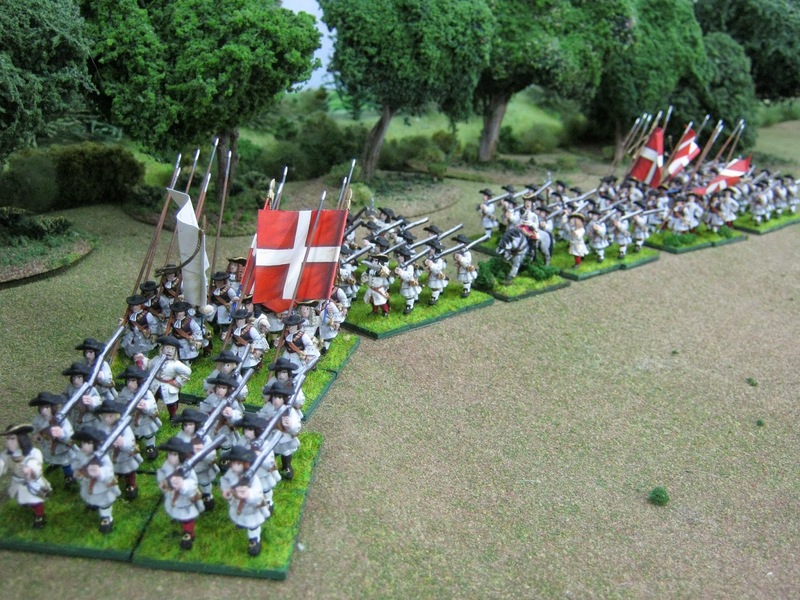 BAR 18th Century and BAR Colonial (General Pettygree) will continue soldiering on as will occasional Blitzkrieg Commander II WWII games, BAR Napoleonic Iberia and a potpourri of many weeknight genres; Pulp, Space Combat, Battle of Britain, WWII Skirmish and Westerns. I've probably forgotten something. Yes: Lost in the South Pacific Adventure. 7) Well, there it is. I hope you enjoyed this little tour. Your remarks are welcome below. Feel free to chat at Comments.